Universal Tool 4.0HP Vertical Grinders are designed with a governed motor for constant speed and housing that is made from high grade aluminum alloy for maximum strength. 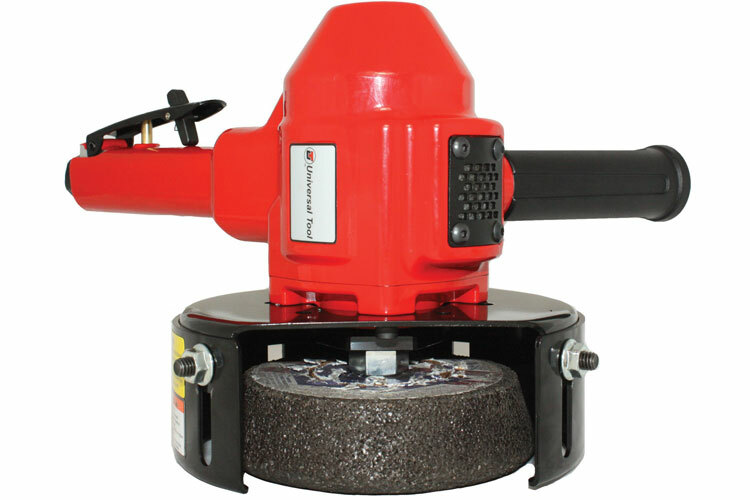 Universal Tool 4.0HP Vertical Grinders feature a safety lock-off throttle and side assist handle for operating comfort, internal silencing that reduces noise level, and wheel guards and flanges that follow ANSI standards. Universal Tool 4.0HP Vertical Grinders are best suited for heavy duty continuous grinding. The UT8768-4V-60-6 Universal Tool 4.0HP Vertical Grinder is one of thousands of quality tooling products available from MRO Tools. Please browse Universal Tool Vertical Grinders for tools similar to the UT8768-4V-60-6 Universal Tool 4.0HP Vertical Grinder. UT8768-4V-60-6 Universal Tool 4.0HP Vertical Grinder description summary: Universal Tool 4.0HP Vertical Grinder. Motor (hp): 4.0 Motor (Kw): 2.93 Max. Wheel Diameter: Type 6'' Cup Guard Type: Type 11 Speed (RPM): 6,000 Exhaust: Side Spindle Size: 5/8''-11 Weight: 11.50lbs/4.80kg Length: 12.75''/324mm Air Inlet (NPT): 1/2'' Quantity discounts may be available for the UT8768-4V-60-6 Universal Tool 4.0HP Vertical Grinder. Please contact MRO Tools for details.